Jack in the Box is among the nation’s leading fast-food hamburger chains, with more than 2,200 quick-serve restaurants in 19 states. Jack in the Box pioneered a number of firsts in the quick-serve industry. It was the first major fast-food chain that started as a drive-thru, and it was also the first to introduce menu items that are now staples on most fast-food menu boards, including a breakfast sandwich and portable salad. Today, Jack in the Box offers a broad selection of distinctive, innovative products targeted at the fast-food consumer, including hamburgers, specialty sandwiches, salads and real ice cream shakes. 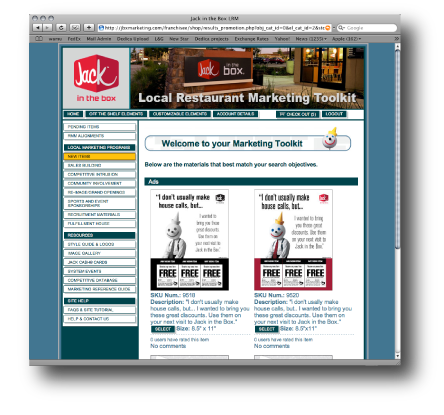 Headquartered in San Diego, California, Jack in the box operating a 60/40 split between corporate and franchisee owned restaurants. Could be integrated with their back-end systems and suppliers, and was easy enough to be rolled out nationally with minimal end-user training. 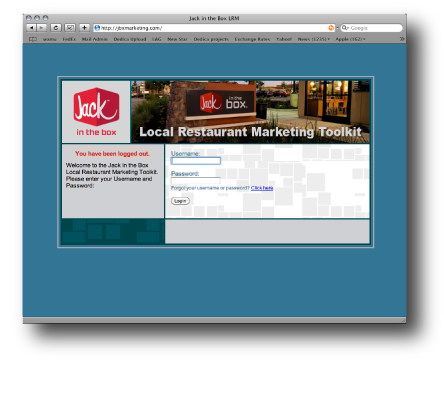 We worked with the Jack team to build out the software to support promotional elements targeted by area, region, and corporate/franchise status allowing Jack in the Box to run and test specific promotional elements and messaging to a particular demographic or geographic region. The tool was extended to provide multiple access levels including store manager, franchisee, vendor, regional manager, backup regional manager, and super user. These multiple levels of access provide granularity required by the business. 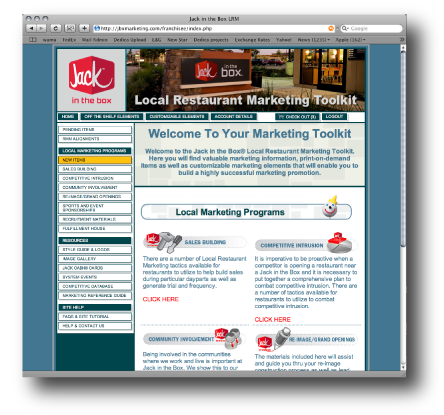 Franchisee and store manager responses to the toolkit were overwhelmingly positive from day one and the general consensus by users of the tool is that Jack in the Box has now given them the tools they need to be proactive about their local marketing. Following the successful launch of the tool, QSR Magazine awarded it the 2010 Applied Tech Award for Operations Technology.